“You have to die so that we can live.” So says Lucas, a teenager from a survivalist compound that goes by the name of Safe Haven, before he coldly shoots his father execution-style in the head. 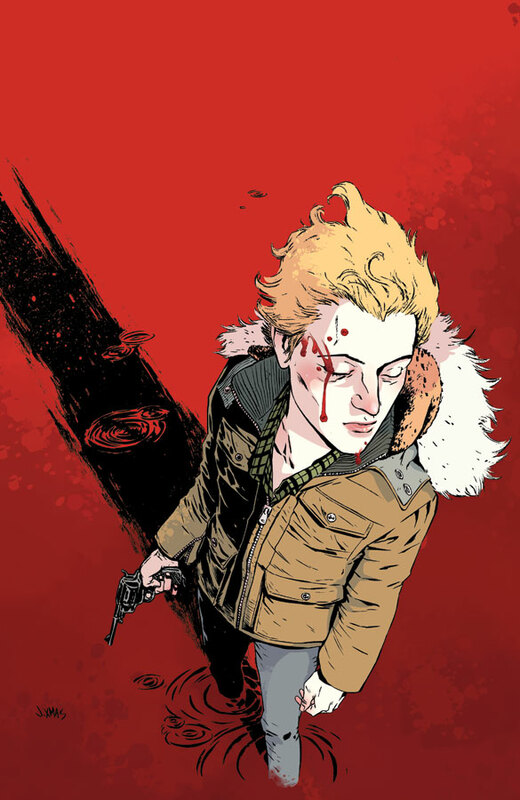 “Sheltered”, as described on the cover of the trade, is a “pre-apocalyptic tale” created by writer Ed Brisson and artist Johnnie Christmas. In the first five issues collected here, Brisson and Christmas weave a mystery involving the rebellion of children against their families, who have hidden them away from what they believe to be impending doom. Lucas, the self-appointed leader of the compound’s children, has a reason for killing off the adults that is quite logical to him and (seemingly) most of the others. However, clues instead seem to point toward a more nefarious rationale. The people of Safe Haven originally built their camp forty miles from civilization in order for them to survive what they believe to be the impending destruction of North America by a volcanic eruption at Yellowstone Park. The children, instead, might have a human villain, besides the natural disaster, to fear. The minimalism of story and art contributes to the primal and intensely emotional actions and psychological manipulations that color a fascinating and beautiful book. Brisson has written a suspenseful thriller within a cautionary tale within a Shakespearean tale. Some of the kids have doubts about their leader, Lucas. There are double crossings, lies fabricated, and obfuscation throughout the proceedings committed by all characters involved. Brisson’s story may be a slow burn, but this only aids in the suspense and mystery that Brisson and Christmas are delicately building. The reader, within these first five issues, comes to care about (as well as loathe) characters whose pasts haven’t been fleshed out just yet. Minimalism of story is something that can be done exceptionally well in the comic book medium, but only if the artistic collaborators are up to the task of expressing the writer’s vision. Both Christmas and colorist Shari Chankhamma are outstanding and are able to convey emotion through small moments as well as violent ones, and realistic (and sometimes clever) dialogue that is supplied to them by Brisson. Lucas is truly a twisted teen. Dialogue is important to this story because the reader isn’t given any insight of what is going on in these children’s heads. Lucas can be coldhearted one moment and then turn around and convince others that his mission is for the best of the group. Brisson has created a character who acts like a cult leader and, with his words, can be at turns convincing, soothing, and savage. In one beautifully horrific scene, the parents’ dead bodies are being thrown into a large fire. Lucas stands tall watching with a stoic demeanor, and describes how the bodies must be positioned in order to burn completely without leaving evidence. He then says their parents would be proud of them because, “We didn’t let our hearts cloud our minds.” This boy-king definitely has a grasp on his kingdom, and it shows. Character is expressed beautifully through the facial expressions and body language that Christmas utilizes through his artwork. 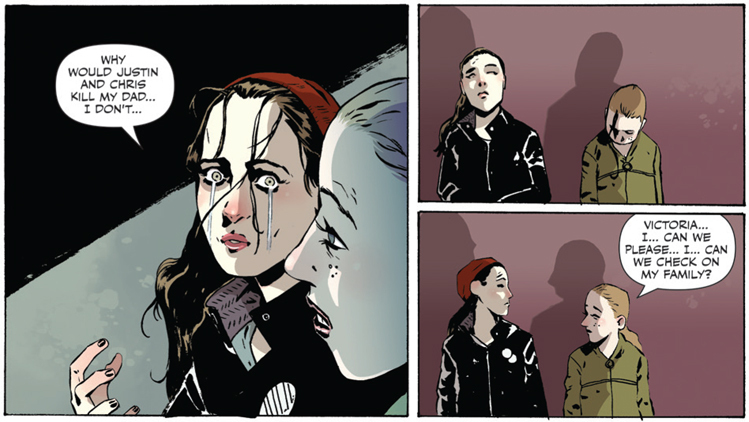 When teenagers Victoria (or Vic) and Hailey are introduced in the first chapter, their close friendship is expressed through their interaction. Hailey jumps on Vic when she spots her, with a satisfied grin on her face. Vic’s body tenses up in surprise and her hair dramatically lifts to the sky. In the fourth chapter, Lucas has a conversation with a kid named Joey. As Joey begins talking, he’s cowering near a door jamb, clearly afraid of his leader. Even his brow is furrowed. Shadows linger throughout the room and is used to great effect (just as it is throughout the book). Lucas seems to put Joey at ease with a stern pep talk and then, suddenly, Lucas’ face turns to one of caring concern as he asks Joey how he got “that shiner” on his face. Christmas conveys that concern beautifully with the use of furrowed brow and lips, warm blue eyes, and tilt of the head. This is just one example of the various emotions Christmas can convey, whether the story calls for them to be subtle or exaggerated, depending on what’s happening in the story. Christmas and Chankhamma work beautifully together on the art. Exaggerated expressions and action is important, as stated before, because of the minimalism inherent in the story. When any of the children cry, tears flow as if coming from a faucet. When blood is shed, huge gobs of it spread or spill. When Joey fights with two particularly bratty children, the action is not “clean” and brimming with precision. They fight like children, with exaggerated pushes and punches. Christmas gets across in this scene, and throughout the book, that the players in this yarn are not grown men and women. Their emotions are larger than life because they are young children or teenagers. Youngsters are going to let their emotions control them, even more so than adults (it seems) do themselves. Shari Chankhamma’s colors add dimension to Christmas’ art, enhancing the atmosphere and mood of the tale. When the flames are burning high and bright as the parents are turned to ashes, bright yellows enhance the pages and add a lightness that contrasts starkly with the reprehensible actions that have occurred against the adults. A sense of eeriness is present in this scene when Lucas’ blond hair blends in with the flames and adds foreshadowing of the machinations that will continue to be carried out as the story advances toward more confrontations and heinous actions. 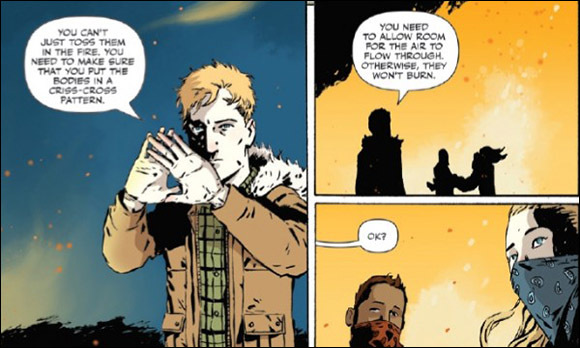 Both Brisson and Christmas are, rightfully so, listed as co-creators of “Sheltered”. The reader can understand what’s going on in many scenes by simply looking at the art without reading the words. One of the hallmarks of a great artist is when emotions and actions can be interpreted through visuals alone. Christmas does this from the very beginning until the cliffhanger ending of this first volume. Brisson is deserving of accolades as well, with both creators working in tandem to create something that is clearly very dear to them. We may not know what is going to happen yet (or even why), but we are made to care about a story that is only beginning to pique our curiosity. The middle of nowhere has never seemed so empty, yet so full of intrigue. Pre-apocalyptic stories, as Brisson, Christmas, and Chankhamma prove, can be just as exciting and dangerous as post-apocalyptic ones. There is no shelter from the storm that is only beginning and promises to only get worse as events escalate even further.